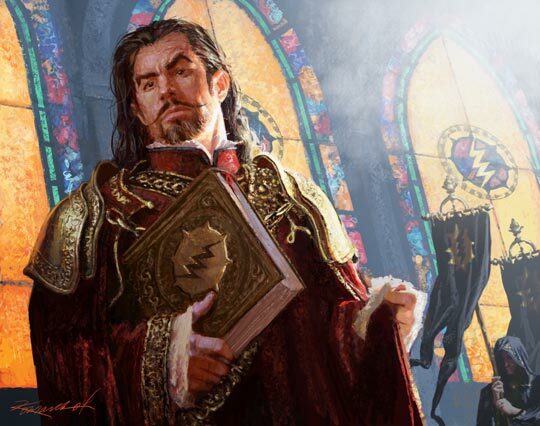 Patriarch Charisbonde "Trueservant" Belon is the highest-ranking priest in The House of the Morning, the church of Amaunator in the farming community of Eveningstar, Cormyr. He is tall and slender with wizened features and inky black hair streaked with bands of radiant silver. He is most easily recognizable for his ostentatious form of dress: bejeweled robes of crimson and gold. Though religious study is his primary function, Belon's most marketable ability is his conventional wisdom, which he employs to settle trade disputes and make sound investments in the community. He is a shrewd businessman and, even with all of its charitable works, in so many years the House of the Morning has never failed to turn a profit. Belon's values are typical for a servant of the Morninglord: he provides aid and fosters hope, new ideas, and prosperity. Outside of sermon, he has a certain reverence for topics that concern Amaunator, but he never hesitates to speak his mind. Because of his lawful nature, he's struggling least of all the priests to adjust to the return of Amaunator and their abandonment of the dogma of Lathander.